Last week the Californian band Haim were named as BBC's Sound of 2013. 2012 was a great year for pop with female music artists dominating the chart especially in the first few months of the year. The end of the year seemed to be a return to male pop stars with Bruno Mars, Robbie Williams, PSY and James Arthur all having great chart success. However throughout 2012 there did seem to be two main categories of chart music female music artists. One group consisted of pop stars such as Rihanna, Katy Perry, Carly Rae, Cheryl, Nicki Minaj, Jessie J and many other pop dance music artists, even Florence Welch went dance (twice) to have a number one hit. The other female artist music genre had to be or sound like Adele and Emeli Sande. Pink, Paloma Faith and Ellie Goulding are somewhere in the middle of those two categories it has to be said too. 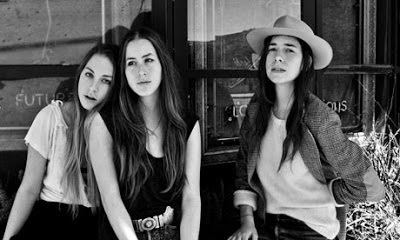 If Haim are the first of a new or a return to genre of music in 2013 that highlights female musicians then it will be a very welcome trend in the worldwide singles charts. There were several great new female groups such as Stealing Sheep and First Aid Kitwho deserved chart success in 2012 and hopefully 2013 will be their year. Haim's newest single Don't Save Me is a great pop song. It was released in 2012 and was Zane Lowe's 'Hottest Record' on his BBC Radio 1 show back in mid October but now in January it is finally becoming a hit.